When an angel dares to cross the line, he stumbles into the harsh reality of post-Cold War Berlin and finds himself engaged in deadly combat to protect the mortals he loves. The gravity defying imagery of director Wim Wenders (Wings of Desire) give wings to this daring film of suspense and intrigue. Otto Sander and Nastassja Kinski lead an all-star ensemble cast that includes Horst Buchholz and Willem Dafoe with cameo appearances by Peter Falk and Mikhail Gorbachev. Winner-1993 Cannes Film Festival Grand Jury Prize. Take flgiht for a spiritual film odyssey impossible to forget. DVD: Widescreen 1.85:1/16x9; audio German Dolby Surround 2.0, French Dolby Surround 2.0; subtitles English, Spanish, French, Portuguese; closed-captioned; single sided - double layered; 28 chapters; rated PG-13; 146 min. ; $24.95; street date 9/12/00. Supplements: Audio Commentary from Director Wim Wenders; Production Notes; Talent Files; Theatrical Trailers. "Wim Wenders stole this song from the Beatles - we're stealin' it back!" - Bono prior to a 1993 performance of "Stay (Faraway, So Close!)" in Australia. Were it not for U2, I doubt I'd ever have known much about Wenders, a German film director. Actually, even with the band's support, I still have little awareness of Wenders' work. U2 contributed the titular tunes for his 1991 film Until the End of the World and 1993's Farway, So Close!. Further collaboration has intensified this year via Million Dollar Hotel, a Bono-penned tale directed by Wenders. Despite my affection for U2, their attachment to Wenders was never quite enough to make me check out one of his films. Nor was the fact that I enjoyed City of Angels, a Hollywood remake of his Wings of Desire. My affection for COA remains incredibly improbable - I dislike both "chick flicks" and Meg Ryan - but for whatever reason, the film worked for me. Since WOD is universally touted as the better movie of the two, that probably should have encouraged me to see it, but it didn't. Of course, it doesn't help that WOD isn't available on DVD. However, not only is FSC! - its sequel (or "continuation", as Wenders prefers to call it) - out on DVD, but I could get it for free. My cheapness overcomes many obstacles, so I figured it was time to give Wenders a shot. Like WOD and COA, FSC! tells the tale of an angel who crosses over into the world of the mortals. The difference is that FSC! is set in post-Cold War Berlin and uses that city's integration problems as a backdrop for the plot. Two aspects of FSC! made it not tremendously interesting for me. The first is my problem and I can't blame the film for it, but I think the movie worked less well for me because I never saw WOD. Granted, I wasn't completely clueless about the content since I'd seen COA; it and WOD seem to be similar enough to keep me in-tune with the action. Nonetheless, after I watched the movie I discovered lots of little bits that escaped me. 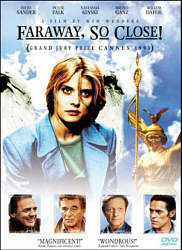 For example, at least two of the characters - Peter Falk (as himself) and Damiel (Bruno Ganz) - both are former angels. This knowledge clearly would have affected my interpretation of the film and my interest in it. I'm also sure lots of the other characters and scenarios echoed the first picture, but those similarities were lost on me. Conversely, I wasn't wild about FSC! because it seemed redundant. Based on my understanding of the first film, this one seemed like something of a remake. That's fine in the case of COA, which uses entirely different cast, crew and settings, but makes less sense for FSC!. It doesn't appear to "continue" the tale as much as retell it with some fairly heavy-handed social commentary included in the form of an anti-gun message. Ultimately, I found Faraway, So Close! to be somewhat interesting, despite my various misgivings. Wenders presents a visually-compelling piece that provides enough stimulation to make it mildly interesting. As such, you may want to check it out if you care for slowly-paced, thoughtful, somewhat esoteric foreign films. Make sure you see Wings Of Desire first, however! Stay (Faraway, So Close!) appears in its original theatrical aspect ratio of approximately 5:1 on this single-sided, double-layered DVD; the image has been enhanced for 16X9 televisions. Although the picture displays a few concerns, overall it looks quite terrific. Sharpness seems excellent throughout the movie, with virtually no signs of softness or haziness at any time; the image remains crisp and well-defined. Moiré effects appear on occasion, but I noticed only minor artifacts from the anamorphic downconversion on my 4X3 TV. Print flaws were a periodic nuisance. I noticed light grain at times, plus a variety of small scratches, speckles and grit mar the presentation on occasion. FSC! marks an unusual combination of color and black and white photography, the color shots probably dominate, but there's still quite a lot of monochromatic material as well. Clearly filters were used to achieve these effects, a technique that usually makes either the color or the black and white photography look less than satisfactory. Happily, that's not a problem here, as both sides of the coin seem well-rendered. Colors are nicely accurate and realistic. The hues tend to be slightly subdued but they appear solid and clean and often look very lovely. Black levels are always deep and dark, and shadow detail seems appropriately opaque but not overly heavy. The black and white shots demonstrate a pleasantly gray quality and show nice contrast and definition; these scenes don't show the murky and hazy tone I'd normally associate with filtered photography. Ultimately FSC! lost a few points due to print flaws, but otherwise I found the picture to present an excellent image. The film's German Dolby Surround 2.0 soundtrack also worked nicely. The forward soundfield seemed acceptably active and lively, with a fair amount of audio that came from the side channels. Actually, a lot of dialogue used the right and left speakers, as the "inner thoughts" of angels and other participants blended the side channels to differentiate it from traditional speech, which came from the center. It's an effective method that clearly makes the internal dialogues distinct. The surrounds contributed a nice reinforcement of the front channels and added a nice aura to the presentation. Audio quality seemed consistently very good. Although German dominates the film, we actually hear a variety of languages, including French and English. Dialogue appeared natural and crisp, with no problems related to intelligibility. The "thoughts" came across as somewhat less clear, but I believe that was the intent; the inner speech has a deeper quality that works well and it all remains easily understandable. Effects are clean and realistic, with no signs of distortion, and the music sounded bright and rich. Overall, it's a fairly modest soundtrack but it serves its subject nicely. FSC! doesn't feature many supplements, but we do find an audio commentary from Wenders. Unfortunately, it's a pretty dull piece. Actually, he starts out fairly well, and the first 45 minutes or so of his discussion relates some decent information; I found it especially helpful since I'd not seen Wings Of Desire and he filled in some of the gaps between the two movies. However, his remarks appear only sporadically during the remainder of the commentary, and even then they offer little insight or data. It's not a terrible track, since it offers some compelling details, but I thought it was fairly dull. The rest of the extras fall into the category of "DVD stand-bys". We get trailers for FSC! plus other arty offerings Dancing at Lughnasa and Orlando. The usual extremely perfunctory and fairly useless "Talent Files" appear for Wenders and actors Nastassja Kinski, Bruno Ganz, Peter Falk, Willem Dafoe, and Otto Sander. Finally, we find brief production notes in the DVD's booklet. My feelings about Faraway, So Close! remain torn. On one hand, the film seemed to do little more than retell Wenders' prior effort, yet it doesn't stand on its own very well. On the other, he makes the movie visually-stimulating and occasionally compelling. The DVD provides pretty good picture and sound plus a dull but sporadically informative audio commentary. Ultimately I'd recommend FSC! to fans of the genre or those who liked City Of Angels and are curious to see more. However, absolutely anyone who wants to watch FSC! should see Wings Of Desire first; I can't state absolutely that this experience will make the "continuation" more interesting, but I have to believe it will.